Reinforced Edges. The regal luxury mattress features a Double Sided pillow Top with a total mattress thickness of 36cm. 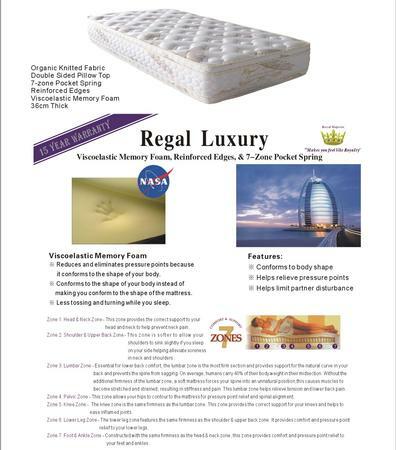 The Regal Luxury mattress is available in Single, King-single, Double, Queen and King size. - Zone 1: Head﹠Neck Zone- This zone provides the correct support to your head and neck to help prevent neck pain. - Zone 2: Shoulder﹠Upper Back Zone-This zone is softer to allow your shoulders to sink slightly if you sleep on your side helping alleviate soreness in neck and shoulders. - Zone 3: Lumbar Zone-Essential for lower back comfort, the lumbar zone is the most firm section and provides support for the natural curve in your back and prevents the spine from sagging .On average, humans carry40% of their body weight in their midsection. Without the additional firmness of the lumbar zone, a soft mattress forces your spine into an unnatural position. This causes muscles to become stretched and strained, resulting in stiffness and paid. This lumbar zone helps relieve tension and lower back pain. - Zone 4: Pelvic Zone-this zone allows your hips to contour to the mattress for pressure point relief and spinal alignment. - Zone5: Knee Zone-The knee zone is the same firmness as the lumbar zone. This zone provides the correct support for your knees and helps to ease inflamed joints. - Zone 6: Lower Leg Zone-The lower leg zone features the same firmness as the shoulder﹠upper back zone. It provides comfort and pressure point relief to your lower legs. - Zone 7: Foot﹠Ankle Zone-Constructed with the same firmness as the head﹠neck zone, this zone provides comfort and pressure point relief to your feel and ankles.